Monique van der Vorst is one lucky lady she can walk once more. During a freak accident as a child Monique lost the use of her legs after a surgery went badly. Her leg swelled up and filled with fluid. She was 13 at the time. Her family tried everything, but hope was lost and Monique settled into her new life as a paraplegic. Today, she is walking again. She began to feel her leg once again in the summer and as the days went by her leg began to come alive along with her other leg until once more she can walk again. 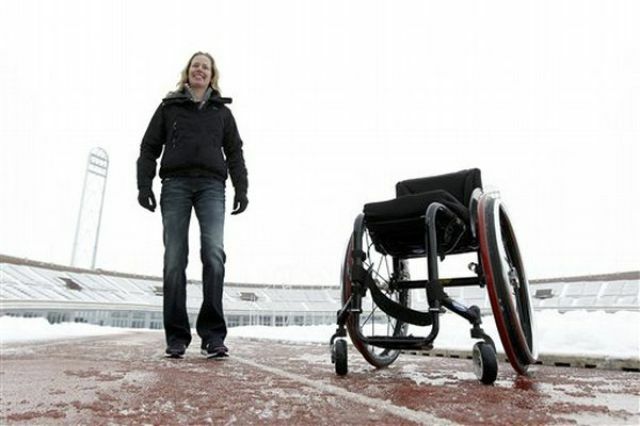 Her only drawback is not being able to compete in the Paralympic Games. She competed in the 2008 games in a neck brace. She was hit by a car during practice in Florida, but it didn’t stop her. She has the heart of a lion and just pushes on no matter what her difficulties. She was struck again in by a cyclist that caused her to go crashing to the ground her legs in spasms. This is what she thinks might have re-triggered the use in her legs. She was put into the hospital and after extensive rehab causing her back to scream in pain she began to feel a tingling in her left foot. She progressed to feeling her legs and taking those tentative first steps. She says that she fell over and over again glad that she couldn’t feel the pain, but continued to press herself and now she can stand up and see people eye to eye and walk. Her dream now is to compete in an Ironman competition. Learn Something Fun: In 1979 the first Ironwoman, Lyn Lemaire, from Boston competed in the second Ironman competition and came in sixth of the fifteen competitors.